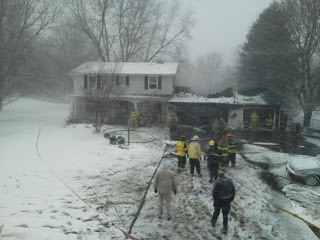 As the first winter storm of the 2012 season hit the area Penfield Volunteer Firefighters were called out at 8:15 AM to the report of an attached garage on fire in the 2700 block of Penfield Rd. Engine 374 from Station 3 which is located just down the road arrived on scene first and reported a working fire. Firefighters who drove to the scene quickly grabbed hand lines and began knocking the fire back. Additional apparatus from stations 1 and 2 arrived shortly after setting up a supply line to the hydrant and providing more man power for an aggressive interior attack. 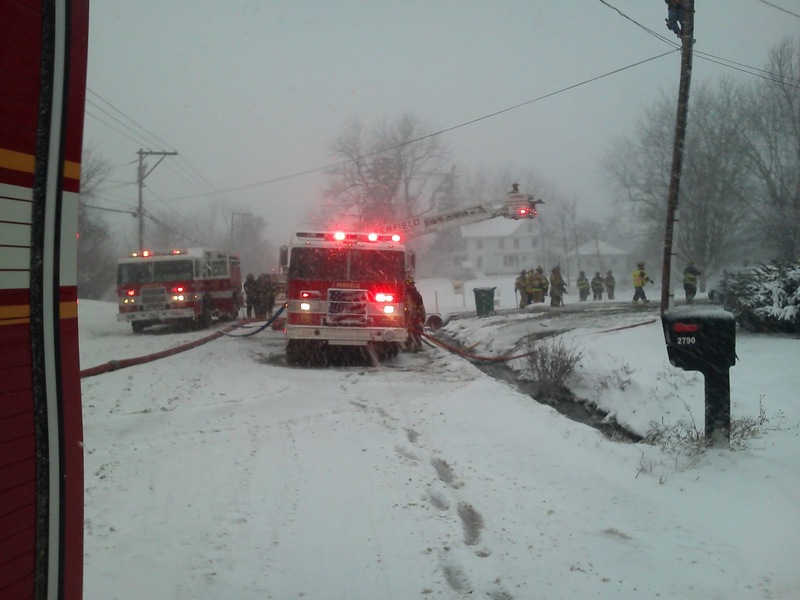 25 degree temperatures with 25 MPH winds hampered firefighters as they fought the blaze. The fire was mostly contained to the garage and a 4 seasons room in the rear of the garage. There was damage to the rooms next to the garage as fire had found its way through the wall and ceiling of the first floor. 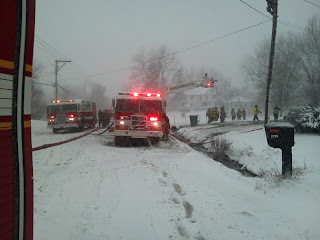 Nobody was injured, the fire is still being investigated. 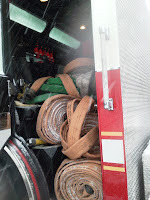 Volunteer firefighters were out for about 3 and a half hours at the scene plus and addition 2 hours back at the fire station cleaning and getting the equipment back in service. The Penfield Volunteer Ladies Auxiliary braved the cold winter storm and provided hot food and beverages for the firefighters as they returned. On a side note we'd like to send our gratitude to the homeowner who was standing out front and took the time to alert the firefighters of the hazards located in the garage. That homeowner showed concern our safety and we greatly appreciate that.